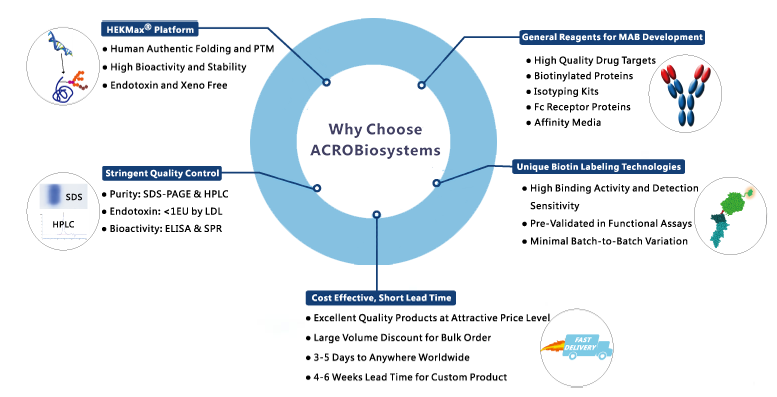 ACROBiosystems is an internationally recognized manufacturer of recombinant proteins committed to support cancer immunotherapy. They specialize in mammalian cell-based recombinant protein production and process development to support professionals from pharmaceutical companies, CROs and research institutes, providing high-quality proteins, antibodies and assay kits. Proprietary HEK293 expression platform with strict animal-free and xeno-free conditions. ActiveMax® brand is dedicated to highly characterized biological activity (besides protein identity, endotoxin,…).